Unless you are living under a rock, you’d probably know that the FIFA U17 World Cup is just a day away. This is the FIFA tournament that is happening in India and the first ( of many) FIFA tournament India is playing. We play all our group stage matches in Delhi. The Jawaharlal Nehru Stadium is ready to host the young Blue Tigers. 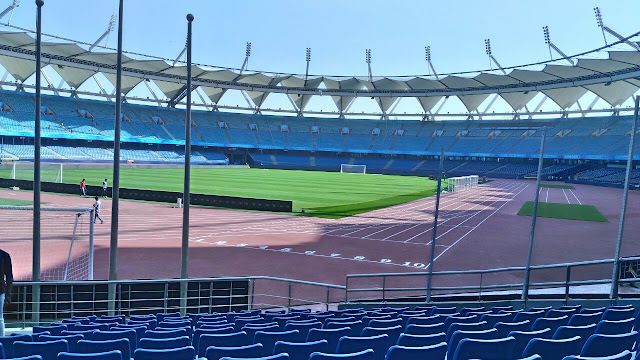 Delhi, which is often accused of being ignorant about football, is ready to show the world that football does occupy a special place in its heart. Fan groups from all over the country are gathering in the capital to support the young colts, among which we are also a part. For over a month these Indian Football fans have been busy preparing chants and posters for the country and the players. You can put your money on JLN being converted into a fortress by the fans, it'll surely be a sight to behold. With the stadium already being sold out due to the efforts of various fan supporters group, the decibel levels will be sky high and hope the opposition brings their earplugs along. The Blue Pilgrims, the fan group of the Indian Football team was recently formed by the integration of fan groups all around the country is a welcoming sign. They'll have a major role to play in supporting the Blue Tigers. But the Arena Army will also not be far behind and will give our very best to support our team, we have got our very own special chants prepared so do watch out Team USA. The excitement and expectations of the fans are at an all-time high, you can almost sense it in Delhi’s air. The love for the game and the country has brought everyone together. You can be a Delhi Dynamos fan or a Mumbai FC fan but on 6th of October, all of us would be Indians just Indians. We all together will bring the house down( just figuratively). The U17 team is full of talented, sincere and hardworking players, who have put all in for their country. Watching them play over the span of last 9-10 months has really up-ed our expectations. Being lucky enough to have interacted with few of the stars of the team, it suddenly dawns upon you that how humble they are even after achieving so much at such a young age, which is the true sign of champions. AIFF has invested a lot in the young guys and rightly so. The facilities being provided to the U17 players is the best and the exposure tours have been a good learning curve. It is so great to see that sports other than cricket are being paid attention to. The road for India regaining its supremacy in the Asian football is a long one, nothing is going to happen over a fortnight. But we have put in a lot over the last half a decade or so and I am confident that we'll surely rise again. The U17 FIFA World Cup is just the start towards achieving our goal. To be realistic, the chances of is being crowned champions at this event are not much but again only idiots get bogged down by probability. If the lads put a performance that'll make the world stand up and take notice then they surely would have achieved the goal. If even one of the U17 player gets scouted and makes it to the European leagues, the World Cup will be a success. Remember Rome wasn’t built in a day but once built, it has always stood strong.